The choral preludes here are based on tunes which would have been common and popular in their day, and so we get four different choral preludes in Jesu meine Freude, and other tunes reoccur to our aural delight. The final one being the lovely Wie schoen leuchter der Morgenstern, which is played with poise by Simon Desbruslais on a modern trumpet. Whilst the choral prelude is the most common type of piece on the disc, the works on the disc cover an interesting range of styles as we hear music in transition. Included on the disc is Gottfried Homilius's Sonata for Oboe, definitely a work which is exploring the changes happening in music looking towards the galant style. Whilst Bach's Organ Trio III from his early years in Leipzig is from a highly admired group of works and is here played with the top line given to the oboe. 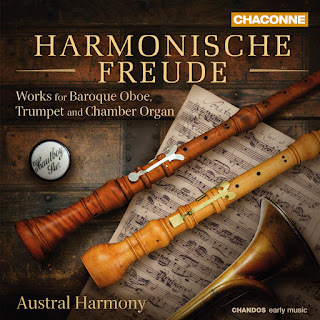 Austral Harmony is in fact an Australian group (the name comes from an early collection of Australian poetry) though the recording was made in the UK and trumpeter Simon Desbruslais is British. With Peter Hagen playing a chamber organ and Jane Downer a modern reconstruction of an 18th century oboe, the three performers produce a lovely blend of highly sophisticated chamber music and make us really think that these three instruments were made to be together. Hagen gets some solo moments, playing Krebs Fantasia, Praeambulum supra 'Jesu, meine Freude, and Chroale prelude 'Jesu, meine Freude', alio modo whilst a number of the pieces are just for organ and oboe, and for two Krebs Chorale Prelude 'Nun freut euch, lieben Christen gmein' and Bach's Chorale Prelude 'Jesu, meine Freude', BWV 713a Jane Downer moves to oboe d'amore. I rather enjoy records which enable us to fill in the some background behind great figures, and when the composer is JS Bach then he does rather tend to loom so strongly that everyone else is eclipsed. This disc not only introduces us to the fascinating world of organ plus instruments, but enables us to hear music by Bach's pupils, younger contemporaries and colleagues. But more than that, it makes a lovely satisfying musical programme.